(MENAFN – Daily Outlook Afghanistan) KABUL – Afghan Hindus and Sikhs at a ceremony in Kabul on Friday said their community has also been affected by insecurity and violence and that they fully support the ongoing efforts for peace as they are tired of war same as other citizens of Afghanistan. They said they hope to see a peaceful Afghanistan in the not-so-distant future. 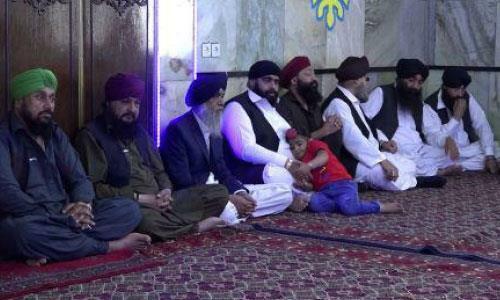 The Hindus and Sikhs remembered the 13 fallen members of their community who lost their lives in a suicide attack in eastern Nangarhar province last year. The ceremony was attended by a number of Kabul residents and government officials. On July 2018, when a number of Afghan Sikhs and Hindus wanted to visit President Ashraf Ghani in Jalalabad city in Nangarhar, a suicide bomber attacked them and killed 13 of them, including Afghan Sikh leader Avtar Singh Khalsa. ‘My father who headed the Afghan Sikhs and Hindus Council and was a teacher lost his life in that incident. Our representatives from Ghazni, our elders and prominent young people were killed in that incident, said Narender Singh Khalsa, son of Avtar Singh Khalsa. Khalsa was the only candidate for parliamentary elections from the Hindus and Sikhs community. His son ran for parliamentary elections after his father’s death. Royender Singh Khalsa, daughter of Khalsa, said they are not only faced with insecurity but they are suffering from injustices in society. She said they want a peaceful life and that they support peace efforts. ‘My two sisters were killed in the past and my uncle was killed when the Kochis attacked our Dharamshala. What has remained for us in this city that we should love it and live for it? Nothing has left for us, our elders have been killed and now only widows and orphans have remained, Royender said. Yusuf Pashtun, an advisor to President Ashraf Ghani, said at the ceremony that the Hindus and Sikhs have been living in Afghanistan for long time and that they have deep roots here. ‘There is no doubt that we accepted Islam, but we are from one tribe, we are brother and we should continue this brotherhood, said Pashtun. An investigation by TOLOnews from last June shows that close to 99 percent of former Hindu and Sikh citizens of Afghanistan have left the country over the past three decades. The investigation revealed that the Sikh and Hindu population number was 220,000 in the 1980s. That number dropped sharply to 15,000 when the mujahedeen were in power during the 1990s and remained at that level during the Taliban regime. It is now estimated that only 1,350 Hindus and Sikhs remain in the country. According to the findings, the main reasons behind their departure include religious discrimination and government’s neglect of the minority group, during the Taliban era in particular. The TOLOnews findings indicate that where Hindus and Sikhs were once very active in business within the country, they are now faced with increasing poverty. The findings also show that Hindus and Sikhs had suffered huge setbacks after the Taliban regime collapsed in 2001. This forced a large number of them to leave the countryside and to migrate to Kabul for a living. As a result, there are no Sikh or Hindu citizens living in Helmand and Kandahar provinces. On the steps of the Sri Guru Singh Sabha Gurdwara, Tirath Singh Khalsa, 11, and his sister, Jasmeet Kaur, 8, waved small Canadian flags and smiled as dozens of members of Surrey’s Sikh community surrounded them. The children, along with siblings Zorawer, 6, Fathe, 3, and parents Havinder Kaur Khalsa, 30, and Shamsheer Singh Khalsa, 40, had just arrived from India, part of a group of Afghan-Sikh refugees privately sponsored by the local community. Prem Singh Vinning, past-president of the World Sikh Organization of Canada, acted as a translator for the group, and said everyday life for the Punjabi community in northeastern Afghanistan is very difficult. “The kids can’t go to school, because they would have to cut their hair and remove their turbans. The women would have to wear burkas, otherwise they are not safe at all, they are stoned. It’s very difficult and very challenging,” Vinning said. He said the family is very grateful to Canada for the welcome. The arrival of Khalsa, his wife and their four kids, and a second Sikh refugee family of six, was an emotional moment for Baljinder Singh Bhuller. 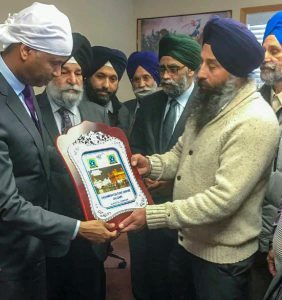 Bhuller was on hand representing his late son, former Alberta MLA Manmeet Singh Bhullar. Bhullar said his son had begun the project of bringing the Afghan-Sikh refugees to Canada before he was tragically killed in a car accident in 2015. The family’s foundation carried on with the work after his death. 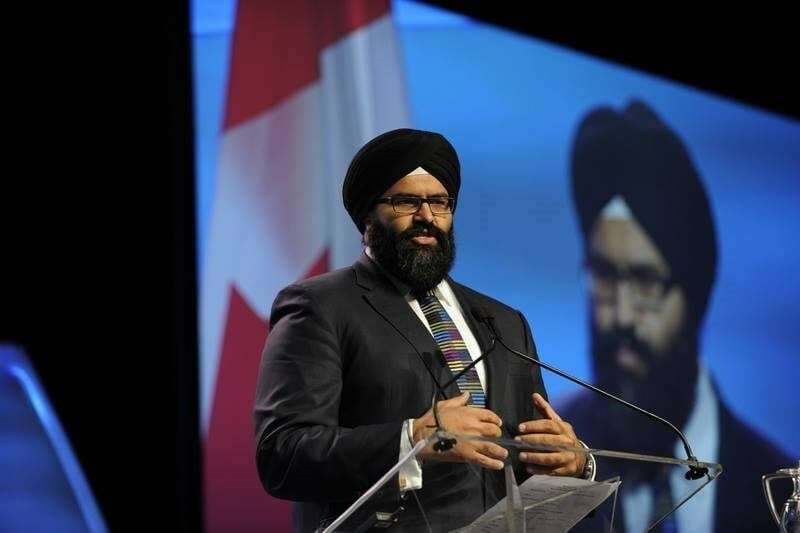 With the assistance of the WSO of Canada, the Manmeet Singh Bhullar Foundation moved 65 refugee families to India, and began the process of bringing them to Canada through private sponsorship. “For over three years we have been providing them with food, shelter and medical care through the foundation,” said Bhullar. Shamsheer said he’s looking forward to going to school — something he was not able to do while growing up in Afghanistan. By the end of the month the foundation hopes to have 18 families resettled in Canada. Between 800 and 1,000 Sikh and Hindu families remain in northeastern Afghanistan. “I would say to the Canadian government to please help them,” Shamsheer said. 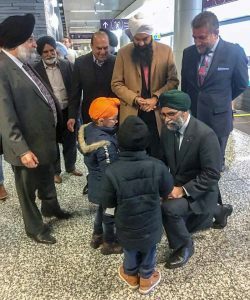 AS part of this year’s celebration of the 40th anniversary of the successful private sponsorship refugee program, the federal government on Tuesday welcomed the first arrival of Sikh and Hindu minority refugee families from Afghanistan which was possible through the generosity of Canadians coming together to help resettle these vulnerable refugees. Defence Minister Harjit Singh along with BC MPs Sukh Dhaliwal and Randeep Sarai. Defence Minister Harjit Sajjan greeted the first privately-sponsored families from among the approved Afghan minority refugee claimants after their arrival in Calgary. He noted that Canada is a global leader in resettling the world’s most vulnerable, which is why the federal government has worked very closely with the Manmeet Singh Bhullar Foundation and other partners to ensure safe resettlement opportunities in Canada. Manmeet Singh Bhullar was a member of the Legislative Assembly of Alberta who was known for his compassion and support for his community. Unfortunately, he tragically lost his life while helping a stranded motorist, but his legacy continues to positively affect those in Canada and around the world. His advocacy was instrumental in starting this process to assist the vulnerable Sikh and Hindu minorities in Afghanistan. The private sponsorship of refugees program has helped resettle thousands of the world’s most vulnerable. The arrival of these refugees is an example of why this program is now being emulated by countries around the world. This program is built on the generosity of Canadians and will continue to help resettle those most in need, Sajjan noted. MEANWHILE, the World Sikh Organization of Canada said it was delighted to welcome the arrival of the first Sikh and Hindu refugee families from Afghanistan to Canada. It said Tuesday’s arrivals were the result of the tireless work of Manmeet Singh Bhullar who championed this cause prior to his tragic passing in November 2015. The arriving refugees have been sponsored through private applications that were spearheaded by the Manmeet Singh Bhullar Foundation with support from the World Sikh Organization of Canada, community groups and individuals carrying on the tireless work of Bhullar. By utilizing the private sponsorship stream, individuals donate the costs of refugee sponsorship, maintaining legal responsibility to ensure settlement supports are provided to refugees. Sikhs and Hindus have endured increasing religious persecution and today face a difficult, if not unlivable situation in many parts of Afghanistan. The Sikh and Hindu communities that have lived in Afghanistan for hundreds of years, now number less than 1,000 individuals. Prior to 1992, their population numbered over 200,000, however due to persecution and discrimination, most have been forced to flee to other countries. The Afghan Sikh and Hindus remaining in Afghanistan are the most vulnerable who do not have the resources or ability to relocate. In December 2014, Sikh and Hindu families from Afghanistan’s Helmand region reached out to the WSO for help. In turn the WSO asked Bhullar for his assistance. Bhulla began what seemed like the impossible task of helping these families on the other side of the world, in what was and continues to be an extremely dangerous region. He single-handedly oversaw the safe exit of each Sikh and Hindu family from Helmand to India and helped find local organizations to assist with their basic needs. As refugees in India have no legal status, receive no government assistance and often live in poverty, Bhullar strongly advocated for steps to help bring these families to Canada. After Bhullar’s tragic passing in November 2015, the Manmeet Singh Bhullar Foundation carried forward his work and with the assistance of gurdwaras, elected officials, the Sikh community and the WSO, we have finally seen the arrival of the first families to Canada.